I have a friend who tends to refer to me as a waitress, and I am continuously correcting him. I’m not really a waitress. We don’t use that term anymore. It has fallen into political incorrectness, much the same way as the term “stewardess” is bad form when talking about a flight attendant. Coincidentally, since I am on my feet 10+ hours at at time, I decided to treat my exhausted tootsies to a pedicure the other day. And they give cutesie names to nail polish these days, like they name paint colors or horses. So I selected a fabulous bright red shade that would also pay tribute to my proper job title. It was called, “I’m Not Really a Waitress.” Nope, I am a server. Or, better yet, a service engineer. A menu consultant. A hospitality ambassador…. I work in the service industry. And here in New Orleans, that is serious business. There are nearly 60,000 people working in the restaurant biz in New Orleans. It wasn’t until I moved here that I started to see service industry workers actually getting some of the credit we really deserve. In New Orleans, there are all kinds of perks: we get discounts in many local bars and restaurants, the occasional special event in our honor, and a lucrative $2.13 an hour! While most places you go, on the other hand, being a server is a pretty thankless, underappreciated job. (Except for maybe in New York City. 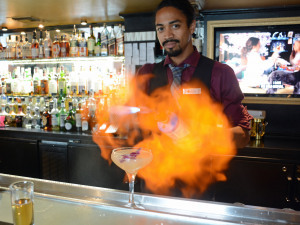 The bartenders are superheroes there, cloaked in all black capes and tights). People tend to take us for granted. To look down on us: “She’s just a server.” They consider our line of work as a job for those who can’t do any other job. A last resort. Plan C. Are you unemployed? “Well, I can always get a job as a waiter at Applebee’s”. For the majority of folks working in the service industry, this is a career choice, not a fallback option. We are not beauty school dropouts. Sure, there will always be those chasing tips merely to pay the bills. But many people do it because it allows them the flexibility to pursue other interests on the side. The actors, artists…aspiring writers. And still others do this because they actually enjoy it. Must be for the glory. I am a server. Or, better yet, a service engineer. A menu consultant. A hospitality ambassador…. So before you drop off your resume at Denny’s, think long and hard about whether or not you really have what it takes to be a good server. There are far more skills and qualifications required for this job than you may think. It’s definitely not easy. 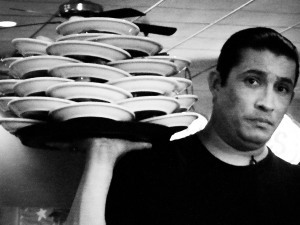 The job requires superhuman strength and marathon-runner endurance to carry all those heavy plates, run circles around the restaurant, and stay on your feet for many hours. We have to have the patience of a saint, the balance of a Cirque de Soleil performer—to steady trays of precariously balanced, tippy glasses, and the flexibility of a Twister champion: Reaching far across the table, without falling over or sticking an elbow in the guest’s face. Keep the tray behind you. Left foot on red. Spin again. We have to be a mindreader and a psychic. We are supposed to assume that since you ordered a Diet Coke, you must also want the sauce on the side. Your faithful server must read between the lines and know what you really meant to order, instead of what you actually asked him for. We also need to be an amateur tailor, due to all the washing and ironing and starching our uniforms require. And a housekeeper, with all that clearing and wiping and cleaning up of other people’s messes. And there are so many rules and regulations, it’s like following a military regiment. To get to where we are now, we’ve all been put through service boot camp. Serve from the right. Clear from the left. Ladies first. Don’t point. Never cross your arms. How to walk. How to talk. You need the dedication and discipline of a marine. We are the few. The proud. The undertipped. But be polite. Be perky. At all times. Keep that corkscrew in your pocket and the smile of a pageant queen, or an escaped lunatic, permanently glued on your face. If you’ve ever thought any dummy could do this, think again. You need above average intelligence and a photographic memory, as you will be required to know every single ingredient of every single item on the entire menu, along with having the wine expertise of a high-class sommelier, and remembering at least 347 drink recipes. Most professional servers could probably get into med school with their knowledge of every conceivable food allergy or digestive reaction. And you better YouTube your Top Chef episodes, because you need to know your velouté from you béchamel from your remoulade. And your baguettes from your pistolettes. Not to mention most of us are genius-level math whizzes who can calculate 20% of any number, quicker than you can say cheapskate. You’re right, it’s not rocket science. It’s far more complicated than that. Compared to the service industry, rocket science would be a piece of cake. Cake? Don’t forget the dessert spoons. So….the next time you dine out, treat your servers well. You are probably dealing with trained professionals worthy of your respect. Be nice to them and they’ll be nice to you. It’s with good reason that they say never to bite the hand that feeds you. Equally important, the hand that feeds you won’t appreciate being stiffed on the tip.